One difficult problem for all vintage computer collectors has been the phenomena of unsightly case yellowing which can turn a cool vintage machine into something resembling a block of cheddar cheese! Fortunately, enterprising enthusiasts have worked on this problem and found a solution. As I have at least five computers that were yellower than they should be I thought I've give it a go myself. The New Zealand summer has high UV levels so now was the time to do it! First though was the problem of ingredients. I needed concentrated hydrogen peroxide and some kind of activating agent like tetra acetyl ethylene diamine, found in laundry boosters. Also, I wanted to make a paste that I could paint onto the cases, rather than the more costly and wasteful method of immersing the cases in a bath. This means I also needed some kind of thickening agent. Others had used Xanthan Gum, but I wasn't sure where to get that from. A 6% solution of hydrogen peroxide (hair bleach) from the local pharmacy. Nothing stronger was available. "Oxi-Magic" (active ingredient: Sodium percarbonate). I couldn't find anything with tetra acetyl ethylene diamine on the label but this product seem to be similar to the one described in the de-yellowing recipe. There were a few other products with the same ingredient. All of them were laundry boosters designed for removing stains and making things "whiter than white". I hoped this would do? White Crest "Arrowroot" . A gluten-free cooking thickener described as "the perfect thickener". I was hoping these would work but before doing anything with my precious vintage computers, I thought it prudent to try the mixture on a highly yellowed spare case. I'd saved an RX-8800 one from the Apple haul especially for this kind of test. It took a bit of trial and error, but this is how I ended up making the paste..
Stir until well mixed, add another couple of heaped teaspoons of thickener, stir, then put in the microwave for 30-45 seconds. Times may vary but after heating this way the mixture turns into a thick gel. Better to underheat than overheat and check every 15 seconds. Stir until the paste is consistent and smooth. Take about 1/5 of a teaspoon of Oxi-Magic, add it to the mixture and stir it in well until it's thoroughly mixed. Although the peroxide was weak, I wore gloves just in case. The photo opposite shows the final product producing some of the expected "foaming". It wasn't violent but it showed a reaction was indeed taking place. As mentioned above, I wasn't sure this would work. 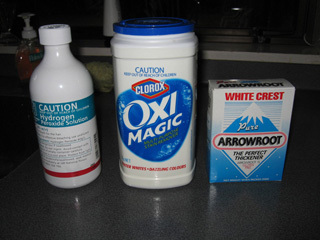 The hydrogen peroxide was more dilute than anything I'd read tried, and I wasn't sure the Oxi-Magic even contained the ingredient necessary. With paste in hand, I painted 1/2 the test case both inside and out. I left this outside in the light for about 6 hours (The mixture needs UV to work), checking every hour and repasting where the mixture had dried. Unfortunately for me, I picked the worst day possible. It was cloudy when I started and the day got progressively gloomier and eventually started to rain! Light levels were low. Despite this, after six hours the treated areas were indeed lighter! The test did prove the mixture worked, at least on the parts of the plastic that were most exposed to the light. This trial gave me confidence that I had the ingredients to do the job. I decided to try the process on my yellowed Vic-20. The next day was also cloudy but not as gloomy. After coating the case, I left the Vic-20 outside on a piece of cardboard for about 8 hours and as before, touched it up from time to time when the paste dried out. Here are the results. The first photo shows the case immediately after the paste was applied (the photo should have been taken before application but I forgot) while the right-hand photo shows the finished result. I am really please with it. Hats off to those who discovered this recipe! My initial fears , i.e. that the peroxide was too weak, and the Oxi-magic was the wrong material proved unfounded. The Arrowroot paste worked like a dream! 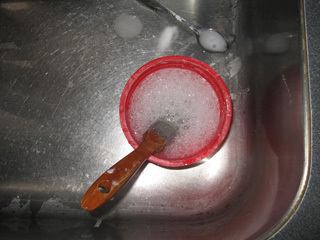 It made a great gel which could be applied easily without dripping and washed off easily in water when the job was done. One improvement in the process would be the use of a UV light (Blacklight) rather than relying on the unreliable New Zealand climate to provide it. Unfortunately I don't own one. I've got other cases I'll process over the summer namely my Apple IIe Platinum, the Atari 130x, my second Colour Genie and my RX8800. I also need to de-yellow the keys of these computers. I'll post the results in another blog entry.